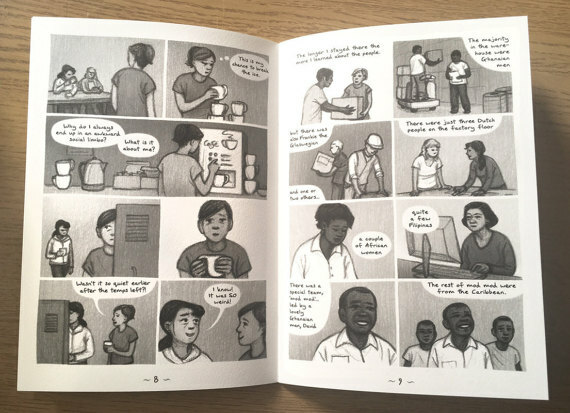 Katzine: The Factory Issue marks something of a departure for Katriona Chapman’s popular semi-regular autobio collection of comics, articles and illustrations. 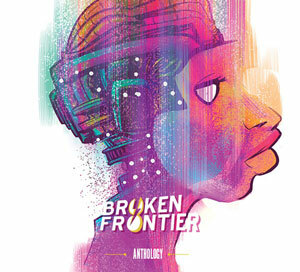 For the first time in the publication’s 7-issue history she forgoes the usual regular array of shorter pieces (with two very brief exceptions) to provide us with the zine’s first nearly book-length story. To a degree this was always going to be something of a creative risk. Much of the charm of Katzine centres on its procession of bite-sized insights into her daily routine from the relatively trivial (but no less engaging) through to the more personal and revealing. 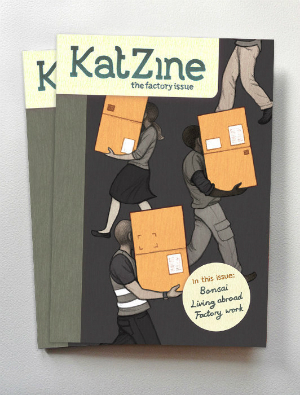 But, dare I say it, despite its uncharacteristically singular focus Katzine: The Factory Issue very possibly makes the deepest connection with its readership to date. Some of that, admittedly, may have a topical link. The subject matter of this issue is a year and a half that Chapman spent working in a factory while living in Amsterdam and, as she wistfully reflects in the book’s foreword, there was a poignancy in recollecting that time given the UK’s imminent departure from the European Union. Many reading The Factory Issue will, no doubt, share very similar feelings. On a perhaps more immediate level, though, ‘Moving Parts’ will resonate with its audience because it will remind them of those “filling in” jobs we all experienced in our younger years. There’s more than a hint of the recursive to the factory’s purpose of making conveyer belts for other factories but Chapman – such is the warmth of her on-page persona – somehow manages to make even the arcane processes involved in their construction seem intriguing and entertaining. But, of course, it’s the shop floor politics that most catch our attention – the cliques, the slightly terrifying but actually fiercely loyal line manager, the requisite bully that haunts every workplace, the odd scandal and the supportive bonds of friendship that gradually develop. Throughout it all Chapman reminds us of the multicultural, international make-up of the factory’s work force and how that diversity enriched the lives of all concerned. What can I write about at this point about Katriona Chapman’s gorgeously rendered, shaded art that I haven’t already been saying since I first started covering her work at Broken Frontier way back in 2012? 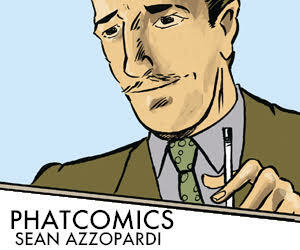 It’s expressive, deft in visual characterisation, able to make the most intelligent use of those moments of “pure comics” (empty speech balloons, for example, denoting a confusing multitude of different languages in the workplace) and a reminder that Chapman’s graphic-novel-in-progress is going to be one of the most anticipated releases of 2018. Katzine: The Factory Issue is a love letter to a place and period of Chapman’s life now lost to all but memory, a eulogy to relationships and people now dispersed and scattered, and a reminder of the vital importance of those lives that touch our own, however briefly. It’s the most beautiful storytelling in its quiet and understated way, with a final page that pulls away panel-to-panel from that era of her life with an empathetic last comment that will bring a tear to the eye of even the most stoic of readers. For more on Katriona Chapman’s work visit her site here and follow her on Twitter here. You can visit her online store here to buy her books including Katzine.